The book was quite addicting. The writing wasn’t spectacular, but I liked the characters, so it balances out for me. And the witty dialogue was great. Many people, the people who hate the book anyway, say the story isn’t original and was borrowed from the Harry Potter series. As I was reading, I found this was true. I think every fantasy book gets compared with Harry Potter, because Harry Potter is such a popular and universal book. Everybody can relate to these books. And, this causes the series to live forever and remains something unforgettable, and thus, becomes compared to other books. Also, I heard that Cassandra Clara wrote some Harry Potter fan fiction or something. So maybe the Mortal Instruments series could have been intended as what-do-I-read-after-I'm-done-with-Harry-Potter kind of book. However, there were parts in the book that were simply, without doubt, glaring with Harry Potter resemblance. I won’t talk about the similarities, because that would give away some spoilers, but my main point is some parts were way too identical. If I list them here that would give away spoilers, so I won't. Another thing was that there were twists in the story, but they didn’t catch me by surprise. There were some clues thrown right at my face, and it was just so easy to guess what was going to happen. So, I was expecting them eventually, and it ended up that when the character faced that part, he/she was so much more surprised than I was. This basically decreased my reading experience (by a lot), and I was like to the character, "Come on, just get over it. It's pretty obvious, you know?" Also, I didn’t for the most part like the ending (well, actually I didn't like it at all). I actually guessed the "big twist" at the end--too predictable, typical, and straight out of Star Wars. So, overall I was pretty disappointed, but I think I would read the next books in the series, just because I'm curious to know what is going to happen next. "Rose as in red, never in blue. Sharp as a thorn, fights like one too." I have never compared this to Harry Potter before, but now that I look at the comments, I can agree somewhat, but as you go along with the series, it takes on its own story (like what bookcrazy said). Plus, the very, very last book has many twists and unpredictable surprises. I completely disagree with this because sure there are those similarities, but you could find character similarities in any story. I mean, come on. Lightwoods and Longbottoms? When I read this series, I couldn't think of any other story like it, so it's like you had to look for stuff to compare. 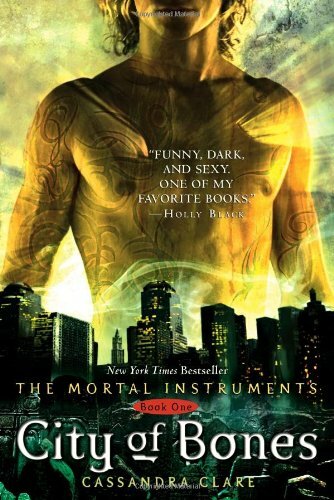 That was an amazing story, and Cassandra Clare is a wonderful author. I think that by the second and third book of the series, Mortal Instruments became a story of its own, but in my opinion, there were several similarities with Harry Potter in CITY OF BONES that were hard to ignore. Of couse, there is no Jace Wayland in Harry Potter, but he resembles a lot like Draco. But like I said, he becomes a distinct character by CITY OF GLASS. well, it might sound and look like harry potter, but let's face there is no Jace Wayland in Harry Potter... I love harry potter but you see the mortal instruments has its own flavor and there's no Harry Potter in it, do you agree?